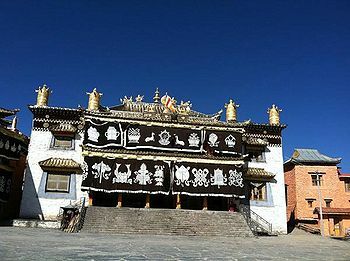 Dartsang Kalzang Gompa aka Kalpa Zangpo Gompa, (Tib. བརྡ་ཚང་བསྐལ་བཟང་དགོན་, Wyl. brda tshang bskal bzang dgon) or 'Monastery of the Fortunate Eon', is a monastery built by Dudjom Lingpa when he was 55 years old. It is located in the Li Gorge, in the Upper Do Valley of Golok, Eastern Tibet (now Serta County, Golok, Sichuan PRC), forty-two miles north of Serta county seat and less than six miles away from the Sichuan-Qinghai border, , over 3000m above sea level. Around the monastery, the area is a vast and open nomadic pasture land, surrounded by spectacular views of high alpine meadows. Dartsang Kalzang Gompa was founded by Yungshül Sungchok Dorjé in 1871 as a branch monastery of Taktsé Monastery (est. 1769) , also in Serta..
Local histories record that Dudjom Lingpa became connected to Dartsang Kalzang Monastery when he was invited by Yungshül Sungchok Dorje and Tashül Tsedrupkyap to become its abbot. In the first autumn month [of 1890], I received a summons from Golok, so I went there. In the year I turned fifty-six, I built Kalzang Monastery on the Lidar family. During the last decade of the nineteenth century until his death (1904), Dudjom Lingpa galvanized Dartsang Kalzang Gompa into a flourishing religious institution by building a new temple to house the complete Buddhist scriptures (the Kangyur and Tengyur) and by giving expansive teachings on his more than twenty volumes of terma revelations. Dudjom Lingpa’s fame spread not only among the monastery’s practitioners in the upper Tashül region but also across the three parts of Golok. Later, after the passing of Dudjom Lingpa it became during the begining of the twentieth century the seat of several of his sons: Tulku Trimé Özer, Tulku Dorje Dradül and Tulku Lhatop. Around the year 2005, a stupa dedicated to Tulku Trimé Özer was under construction around the monastery. ↑ Sarah H. Jacoby, “Love and Liberation, Autobiographical Writings of the Tibetan Buddhist Visionary Sera Khandro”, Columbia University Press, New York, USA, 2014, page 49. ↑ Taktsé in turn is a branch of Katok Monastery. ↑ Dudjom Lingpa, ‘A Clear Mirror’, The Visionary Autobiography of a Tibetan Master’, The Outer Autobiography, translated by Chönyi Drolma, Rangjung Yeshe Publications, 2011, p169-170. This page was last edited on 23 October 2018, at 19:04.